Authentic Indonesian seasoning that delivers the delicious meaty & umami flavour. 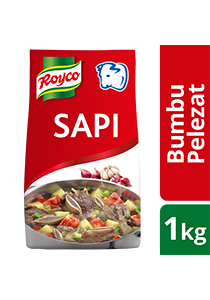 Royco, the No.1 Seasoning brand in Indonesia! Salt, sugar, enhancer (monosodium glutamate, disodium inosinate and guanylate), dextrine, artificial beef flavour (contains soybean, milk, onion (0.15%), blackpepper and white pepper powder, colorant caramel class I, beef meat (0.8%), vegetable oil, turmeric powder, anti caking silicon dioxide, and acid regulator citric acid. Authentic Indonesian seasoning, made from selected beef meat & blends of natural Indonesian spices to deliver rich meaty & umami flavour to your dishes quickly! Easily absorbed to many types of ingredients, therefore suitable for various Indonesian dishes, e.g. soupy, stir-fry, etc.